As we wrap up the first month of the year, we celebrate this week two distinguished Doctors of the Church whose orthodoxy and adherence to the Truths and Traditions of holy Mother Church were exemplary and stand today as the ideal every Catholic should strive for, especially in this time of the Great Apostasy when heresy is dismissed as mere opinion and the doctrines are considered evolving in true Hegelian mindset. 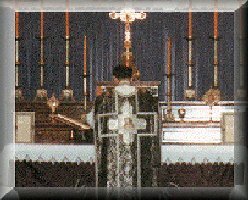 St. John Chrysostom, whose feast is Monday, would have none of it were he here today. 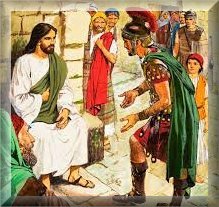 In fact, he would have stood strong against the usurpers, offering up his very life to assure the gates of hell would not prevail. The same for St. Francis de Sales, founder of the Visitandines, whose feast is this Wednesday. 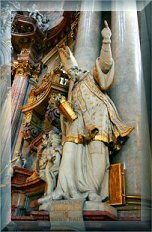 Though he was born in the immediate aftermath of the Protestant Revolution and became an integral part of the Counter-Reformation in carrying out the edicts of the holy Council of Trent, he is very much a saint we should rely on today, especially Traditional Catholic publications for he was proclaimed by Pope Pius XI as the Patron Saint of the Catholic Press. 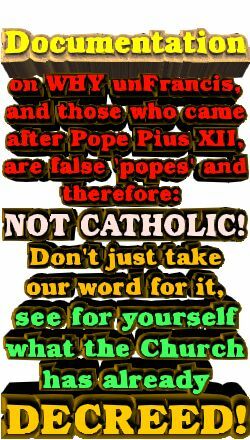 Today there are few who convey in print or on the web the Truths and Traditions of the true Faith, thanks to the terrible black hole created by the demonic "Comet Vatican2" which has shattered the sensus Catholicus in so many ways, confusing Catholics by the man-made religion formed in the sixties. What is needed today is not bodily health care for all, but rather spiritual health care for souls. What's beautiful and fantastic about the latter versus the former which is bankrupting America not to mention souls through the vice of greed, is that spiritual health care is really affordable, in fact it costs nothing except one's willingness to say yes to God and to follow the tenets of Catholicism as laid down from St. Peter through Pope Pius XII. 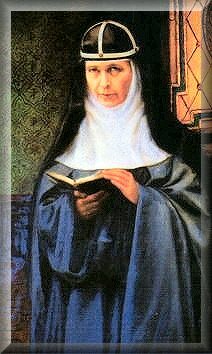 Hell is what this world has turned into, but it was foretold by the Mother of God to an Ecuadorean nun Mother Mariana de Jesus in Quito in the Seventeenth Century that we would face these tribulations for the world and in the Church. 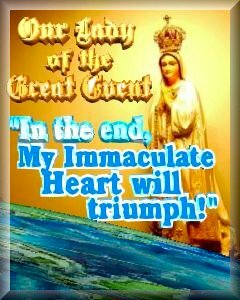 Few would have understood or believed the prophesies imparted centuries ago, but today we can understand them clearly for we are indeed in the time Our Lady warned of. 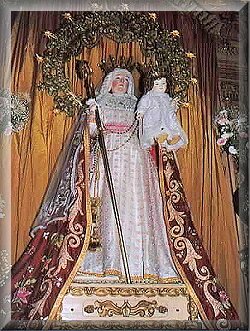 Quito was the first of Our Lady's approved visits that were followed up with Rue du Bac, La Salette and Fatima. We didn't listen and comply and thus we are faced today with the bitter fruits of our inactions. However, not all is lost for we can still petition the Blessed Virgin Mary via a Nine-Day Novena leading to the feast of Nuestra Señora del Buen Suceso , which is known as both Our Lady of Good Success and Our Lady of the Great Event, the latter being put forth as an argument by Karl D. Keller regarding the tie-in to the Fatima message. 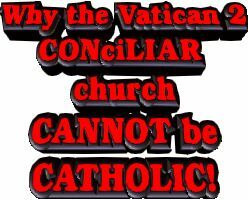 Regardless of the title, any reasonable plea to Mary will not go unanswered. 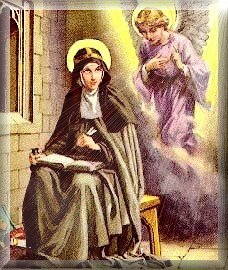 We see that in the approved messages to St. Bridget of Sweden as we continue with Book Four, this week bringing you a chapter each day. They are truly worth reading. They say a picture says a thousand words, but these revelations say so much more and put things in such perspective that will cause all to rethink their spiritual lives and strive to improve on the path to sanctity. If we don't, we are fodder for the devil as you'll see, especially this week when we present some of the most powerful literary treasures she penned, particularly in the chapters for Tuesday and Friday. I guarantee you will be brought to tears, so much so, you may never be the same. So if you're happy in your comfort zone, you might as well click off the DailyCatholic now because the whole purpose of this publication and our mission is to move souls out of their comfort zone towards the path of holiness, something that is expected of every Catholic, every soul. God said it, we believe it, that settles it! 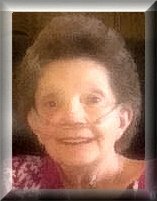 To keep you abreast on the health of my bride Cyndi, she continues under home hospice care. She has her good days and bad days, offering everything up. We still struggle with the bills, but we place it all in God's hands and, again, inform you our readers that we cannot publish if donations do not increase, especially monthly pledges so that we can budget. As has been repeated so many time, it gets so tiresome mentioning that it's the same loyal benefactors who always answer the call, but few others. Ask yourself why? Ask yourself if you do not have a duty before God to help those who labor in the field for Jesus and His True Church with no compromises to the false faith, the "mystery of iniquity" that has deceived so many. Is your heart that hardened that you wouldn't give for a worthy cause? Is not pledging a monthly donation worth it for perpetuating the one true Faith? The answer can only be determined by you and what you deem to be generous and worthy. In Chapter Sixty-Eight of Book Four of the Prophesies and Revelations of St. Bridget of Sweden, Our Lady returns to alert the bride of the dangers of the wicked fox who the devil replicates in his actions and from which we derive the term, 'clever like a fox' for the devil is far more clever than we give him credit for and we need to be on our guard at all times for looks can deceive and temptations can be the death of a soul if one is not rooted in virtue. 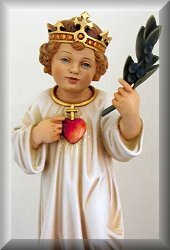 In the journey towards being virtuous, all must guard against the wily demon fox lest one be blinded by the the world, the flesh and the devil and turn virtue into vice, which the Blessed Mother warns, can be the fall of many a man who become discouraged that they are not further along. Some will give up, disheartened and that is exactly what the devil wants. Jesus explains that if one does not seek virtue and do all one can to avoid sin, not only will the fox devour them, but they will feel the wrath of God at one's unexpected death. Beware of being outfoxed. In Chapter Sixty-Nine of Book Four of the Prophesies and Revelations of St. Bridget of Sweden, Our Lord points out the analogy of the good conduct and good deeds of the clergy to clear, refreshing spring water and a priest's bad conduct and bad deeds to filthy, brutish water in a short soliquy to the bride on what pleases him in His sacerdotes and what displeases Him. 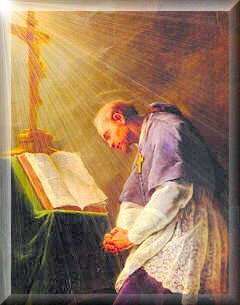 He likens a bad priest to one of a leper who scoops up clean water from the brook, but in his infectious hand it becomes dirty, fetid and loses its purities, thus being of no good to anyone. This equates to pride and concupiscence when a priest, who has taken vows betrays God's trust in him and often can cause scandal, leaving his conduct and deeds to be washed down the drain into the devil's sewer for the evil spirit wallows in the sludge as he invites God's chosen ones to dabble in the fetid waters of the world, the flesh and the devil. Beware of muddy waters. 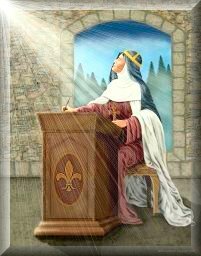 In Chapter Seventy of Book Four of the Prophesies and Revelations of St. Bridget of Sweden, Our Lady pours out her sorrowful Heart to the bride. 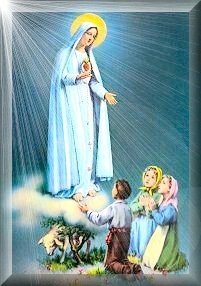 It is a solioquy which few can bear to read for it is a first hand account from the Mother of God on the intimate relationship of her Divine Son and His Mother and how her Immaculate Heart was pierced by a sword. 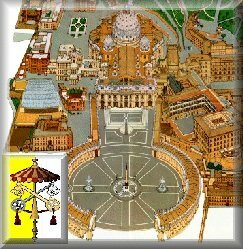 Once you read it, you are guaranteed to feel the terrible pangs she felt at seeing what they had done to her divine Son as she describes in vivid detail how they mutilated our Lord and Savior so mercilessly. 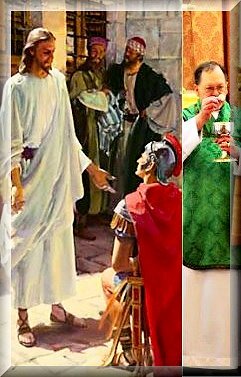 Those who have seen The Passion of The Christ will realize that was nothing to what truly happened to Jesus in His quest to conquer death and open Heaven to those who are willing to follow His narrow path and recognize Him as the Second Person of the Blessed Trinity. Few will read a more poignant, moving account of Christ's passion and death than what you will find in this chapter, which surely must have brought many tears to St. Bridget in listening to a loving mother speak so lovingly of her Son under such cruel circumstances, yet describing her Son's extraordinary handsomeness and form where even His enemies were serene in His presence. 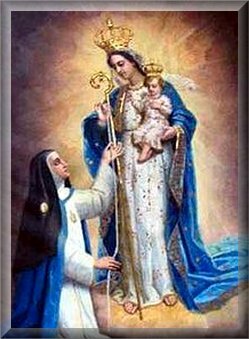 Our Lady's Unbelievably Vivid Account of her Divine Son's Passion and Death. 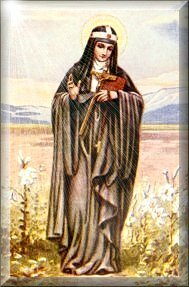 In Chapter Seventy-One of Book Four of the Prophesies and Revelations of St. Bridget of Sweden, Our Lord approaches the bride with four loving questions that might seem on the surface a riddle of sorts, but, following St. Bridget's humble answers to Him, He explains why He submitted three praiseworthy states to the choice of the bride. They are the state of virginity, the married state, and the widowed state. 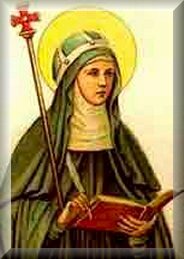 All of which Bridget herself experienced, first as a virgin before taking marriage vows; then her time as a faithful, loving wife who bore eight children; and with the death of her husband, a widow who became a religious. However, to her surprise, Jesus is not referring to her, but as we discover later, it is about one of her daughters as Christ explains His reasons on what was originally presumed did not come about and why. Questions that make perfect sense. In Chapter Seventy-Two of Book Four of the Prophesies and Revelations of St. Bridget of Sweden, Our Lord reminds the bride of His concern for Lazarus, whom He resurrected from the dead, and Lazarus' two sisters Martha and Mary and shows how the sisters stand for St. Bridget and her daughter, most likely Lady Cecilia from Chapter Seventy-One. Jesus points out that the Jews are envious people, and yes, He is speaking of His time, of Bridget's time, and in our time today, as He explains why He raised Lazarus. He also explains how He will give greater mercy to the bride and daughter than even what He did for the sisters of Lazarus for they are in great need of His mercy considering the temptations that abound and His disappointment with those who proclaim Him but are like hollow cymbals for they, like the Jews, do little and become indignant against those who do good deeds. Christ's Mercy Knows No Limits. 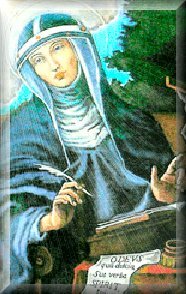 We combine Chapters Seventy-Three and Seventy-Four of Book Four of the Prophesies and Revelations of St. Bridget of Sweden, for the former is possibly the shortest chapter in the entire Book Four and latter, quite possibly one of the longest. The Mother of God presents a Knight who, though declared dead, is not as Mary assuages Bridget that there is hope even though he appears stripped of all his armor & tunic, and left for dead. Our Lady then produces all of Heaven's wisdom in girding him in a detailed explanation that goes beyond St. Paul's words in Ephesians 6: 11-18 of spiritually equipping him for spiritual battle as, one by one, Christ Himself, St. John the Baptist, St. Peter, St. Paul, an angel, and the Communion of Saints share the significance of each member of his body and the Knight's armor and reasons for each as well as the importance of his hands, even listing each finger for a specific prayerful purposes, as well as his legs and even his saddle and horse until he is fully ready to go forth boldly with the spiritual weapons and virtues in defense of the Faith and his own soul and that of others against the world, the flesh, and the devil. Perhaps the length of this magnficent analogy is because the knight happened to be St. Bridget's own son Sir Karl. O Holy Knight. In Chapter Seventy-Five of Book Four of the Prophesies and Revelations of St. Bridget of Sweden, Our Lady consoles the bride after St. Bridget proclaims prayer and praise to Jesus and His Blessed Mother, who then explains to the bride more about her son, the Knight Sir Karl, and why he appeared spiritually dead to her in the last two chapters, and why she should not doubt God's mercy. The Mother of God then shows her that God's righteous decisions often let His power become more manifest through the lies of the devil who, as Our Lady explains, tries four ways to distract, deceive and discourage, and we can surely see his methods in today's world with technology, media, and music that is at best cacophonous and distorted for a purpose: satan's goal to keep us so busy we forget God and our communication with Him. However if one can identify just what the devil is doing and alert others of his wiles, he not only becomes less powerful, but such tribulations of identifying the temptations and seeking to avoid them can lead to greater spiritual benefits for the soul. Diverting the Devil's Distractions.